Freeport, The Bahamas - Memories Grand Bahama Beach Resort and Casino was the location for several live television interview hosted by Breakfast Television Toronto (Canada’s “Good Morning America” TV Show) this week. 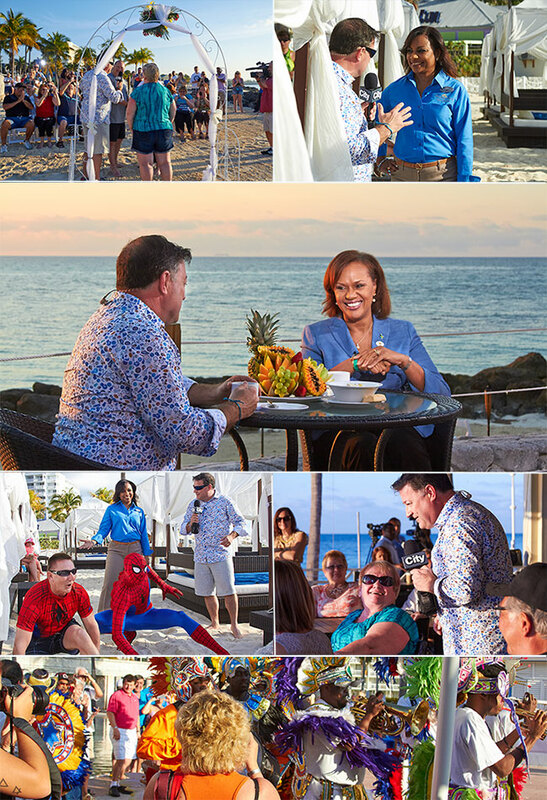 During their stay in Grand Bahama the CityTV Broadcasting network with host Kevin Frankish interviewed Joy Jibrilu, Director General, Bahamas Ministry of Tourism, as well as Gabriel Varela, General Manager, Memories Grand Bahama Resort & Casino. The visit and broadcast took place as a result of combined efforts of Paul Strachan, Ministry of Tourism’s Director of Bahamas Tourist Office in Toronto, and Sunwing Properties Grand Bahama (Memories). The resort was said to be operating at full occupancy, and the island has been enjoying mostly sunny skies with temperatures in the mid-70s. Grand Bahama Island is less than a 3-hr direct Sunwing flight from Canadian cities such as Toronto, Edmonton, Vancouver, and Calgary. The TV production team also featured b-roll of many of the the exciting and relaxing top tourist locations on the island. To watch all the segments, CLICK HERE.